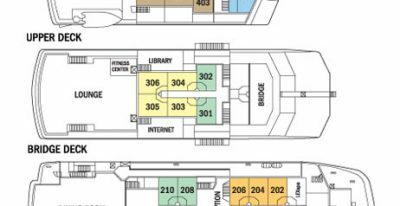 The National Geographic Islander is a 48-passenger ship with 22 outside cabins, 8 of which have glassed-in terraces, as well as 2 suites with wraparound views over the bow. The Islander offers outdoor hammock decks, a library, wellness center, and an indoor bar and lounge that hosts a nightly cocktail hour and photo recap of the day’s adventures. The dining room features fresh local food. Unlike most Galapagos cruises, the Islander’s program begins the day before you arrive to Galapagos, giving you a chance to explore Guayaquil and get to know your fellow passengers. 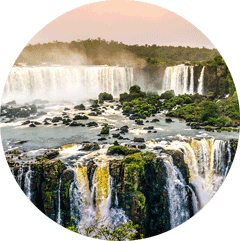 Excursion options include hiking, snorkeling, and kayaking. 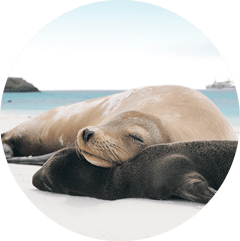 With top quality naturalist guides, great food, and comfortable cabins, this is an excellent option for exploring the Galapagos. 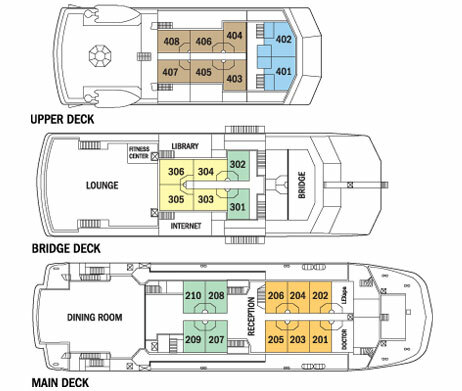 The Islander has 6 upper deck cabins with glassed-in terraces, 2 upper deck suites with glassed-in terraces, 6 bridge deck cabins (2 of which can accommodate a third passenger), and 10 main deck cabins. Length: 164 ft. / 50 mts. Beam: 44 ft. / 13 mts. Draft: 15 ft. / 3 mts. Prices in parenthesis are for children under 18 years of age. Christmas and New Years departures have a holiday surcharge. Contact us for details.